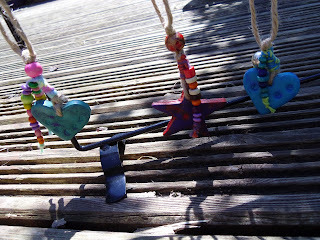 Mosaic Tree - creating home crafts: Hanging hearts and stars! Step inside to find out all about Mosaic Tree, on line shop for home crafts. Created by Maggie and Annie in the west country, its full of handknitted items - hot off the needles! - baby hats, iPod/mobile/blackberry covers, knitted necklaces, spiral brooches......Find out about what makes Mosaic Tree tick, find out what we're up to, share your ideas. Welcome and enjoy! 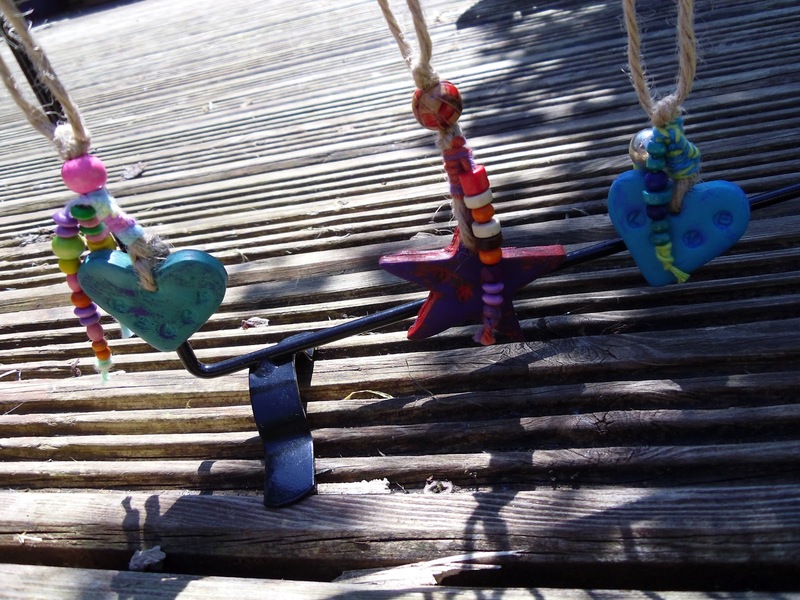 New for this season are the hanging hearts and stars as Mosaic Tree steps into the Home Accessories Department. Measuring 4cm (hearts) and 5cm (star) across at widest point, these delightful hanging decorations will brighten up just about anywhere indoors. 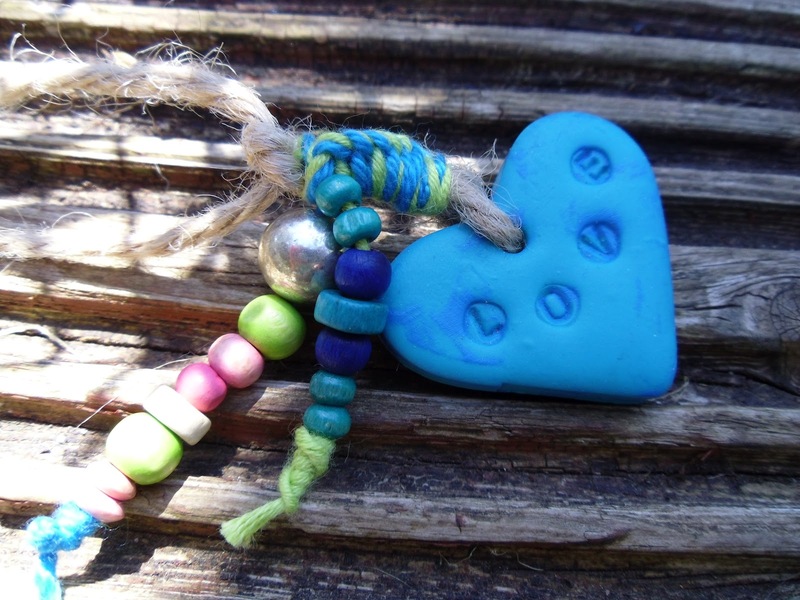 Made from Fimo clay and acrylic paint, then decorated with wooden beads and cotton yarn bound around old fashioned twine, these would also be a lovely gift, sent with love, to let someone know that you're thinking of them. 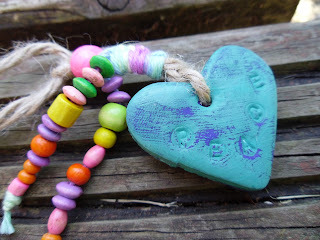 Each shape is handcut from the Fimo, stamped with a message, baked and then painted with acrylic paint. Once dry, the paint is rubbed off with a damp cloth to create the 'distressed' look. Twine is then threaded through the hole, and a carefully chosen selection of yarn and beads added to make each a truly delightful, unique piece, ready to grace your (or someone else's home!). 1x mint green and purple heart with the word 'peace' stamped on it, pastel yarn binding with two strands of pastel wooden beads. c20cm of twine length for hanging. 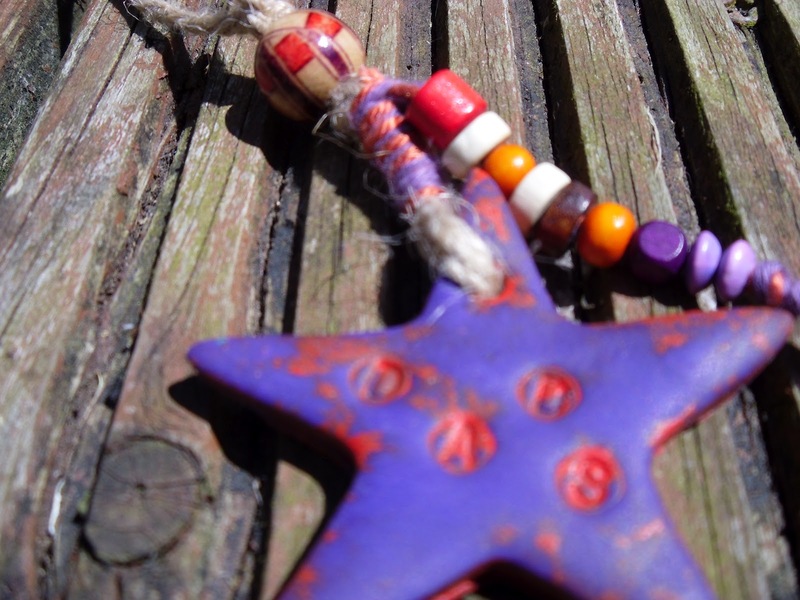 1 x purple and orange/red five pointed star with the word 'dads' stamped on it. Perfect for Father's Day. Orange and purple yarn binding with same colour (and natural wood) bead strand attached. c20cm of twine length for hanging. 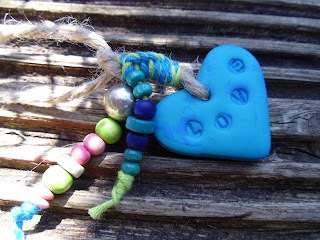 1 x turquoise/blue heart with 'love' stamped on. Turquoise/lime green binding with 2 beaded strands: - pink/lime with silver bead, blue/turquoise. c20cm of twine length for hanging. 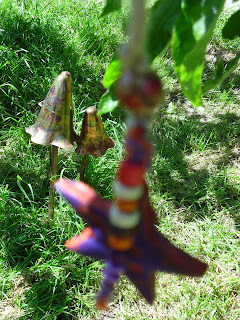 2011 Craft Fairs - meet Mosaic Tree!